It was the end of May of 2016 when we realized that we could not postpone it anymore. Everybody sat down and the meeting began. – We need to recruit new drawing artists! I can't handle this situation anymore! We will not be able to successfully complete any new projects if we don't nip this problem in the head…! – said Klaudia nervously. Micha and I nodded our heads. The discussion began. How about we get the job offer out digitally? How about a video? And how long will it take? Do we even know how to do it? I remembered that I could use some of my recruitment materials from my studies…but how time-consuming will this process be and how will Klaudia be able to do that if she is so overloaded with work? Our schedules are booked up and we have the conference next week! Nobody was up to this dreary task of beginning the recruitment process, but it had to be done. We knew how tiresome it could be, especially when you are trying to source people from the creative industry. We were in doubt that we would even be able to find enough candidates, but we had no choice but to give it a go. I sat down in front of my computer and prepared a standard job offer containing 'Company description / Responsibilities / Required skills / What we offered’. It was not a bad attempt, but it needed to be more convincing to the audience we were to be targeting. If our objective was to target people from the creative industry, we needed to speak their language. We finished our meeting off by agreeing to all be on the same page as we went about this important task. In the evening, Klaudia came up with a brilliant idea. She went to the office, turned the camera on, and spontaneously described the kind of people we needed to be part of our company. When I came to the office the following day, I found out that the recruitment video was almost ready. Klaudia just had to edit the video. – Oh. I remember that there was an idea for a video, but I did not realize that it needn't be complicated and time-consuming! – You will see… it is really cool. I had waited a few hours and it proved that she was spot on. It was now or never. I shared the video on our social platform, and already within five minutes, the feedback was more immediate than was expected. After 48 hours, we were already sure that we would reach our recruitment target without any problems. Klaudia needed new drawing artists as soon as possible, to assist her with her work. Our company produces animated videos for businesses, and due to the constantly-increasing number of projects, we needed reliable back-up. It was difficult because drawing work as a part of ExplainVisually is different from the standard tasks presented to drawing artists. Why? A person has to draw in a ‘live mode’, and that reduces the number of possible corrections. The deadlines are often intense, requiring artists to have the ability to work under a time constraint. The awareness about the limitations of our handmade technique of videos is also important in order to keep our ideas possible to complete. Briefly speaking – we needed very responsible and strongly-rooted-in-the-business reality artists (what is an oxymoron in the eyes of some people). We also knew that the talent we were looking for was extremely unique. That is why traditional job offers on job websites or a LinkedIn promotions were out of the question. We had to approach the recruitment process differently, as it was essential that they fit perfectly well into our company culture and synergy. If the candidates we selected were not correct, it could have an effect on our work production and deadlines and therefore our operational activities, it could be a time-consuming process that could affect our business. Therefore, the stakes were high. We needed at least 3 employees that we could prepare to work in 1 or 2 days. This means almost immediately. Besides being experienced with drawing, being professional, being open to new things and experiences as well as having the ability to work under time constraints, we considered the creativity of the candidates to be of utmost importance. The candidates also needed to be adaptable to our company culture (meaning a ‘home-like’ atmosphere) this was crucial and they were required to have excellent communicative skills with a good sense of humour. The recruitment process was separated into stages of collecting applications, the recruitment task (requiring a few or even about a dozen hours of work and a large dose of creativity) and a telephone interview. Imagery explanation of the job position and the process of the production of our movies. The video was concluded by providing an e-mail address which interested candidates could respond to for their application. We wanted interested candidates to watch the recruitment video to the very end because this way we felt confident that they understood the nature of this unique job vacancy. We already had a video. Now, we had to decide which channels to share it on. The first platform was Facebook. The selection resulted from our description of a target group. We did not associate drawing artists with people who had LinkedIn accounts. Similarly, we agreed on the odds that this type of candidate wouldn't regularly visit job sites like Indeed or Glassdoor. Academy of Fine Arts student group and a drawing artist group. The recruitment video was shared as a Facebook Video. We knew that one of Facebook’s advertising strategies was the promotion of video content, we uploaded the video to Facebook, the end of the post contained a clear ‘Call to Action’ field (application for the job through e-mail) with encouragement to share the video. We also shared the recruitment video on a company profile on LinkedIn and our private profiles. The link also appeared in our email footers. After posting the video on the internet, we went to a marketing conference held in Cracow, Poland. During the break, I logged into Facebook and was overwhelmed by the number of notifications, likes, shares and comments. An increased number of likes – 15%. In the end, we spent about PLN 80 (ca. 20$) to promote the post and acquired almost 16,000 views on Facebook and 570 on YouTube. The recruitment movie also generated a lot of reactions from Facebook users. We took into consideration the quantity and quality of candidates expressing great interest in the position. Fortunately, the success of the recruitment video was not limited only to the number of views. Among those 43 people who completed the task, 29 passed to the next stage of recruitment, which was the telephone interviews. After completing 29 telephone interviews, usually lasting for 1 hour (all of the interviews were conducted by Klaudia), we invited 8 people to join our company. We planned to employ fewer people, but we were so enthralled by their output that we slightly changed the application requirements. After closing the recruitment process, we also created a video that closed the recruitment process. In the next video the ‘future boss’ expressed her thanks to the candidates, which was done in a very personal manner. How we interacted with the candidates – all of the candidates from the final stage of the recruitment process (this is 29 people) received personalized feedback at the end of the process. Despite meaning many hours of work for Klaudia, it was out of courtesy that we informed them why they were accepted or not. Conclusively, our first big recruitment process had been successful. The quality of the candidates was very high and we had a selection of potential employees to recruit. We still have an extensive database of people with whom we could contact should we require additional support in our business. The results proved to be beyond our wildest imagination. More than a year has passed since this recruitment process took place. We still have most of the people we employed through this process and we recruited one more person. Next time we have to recruit new employees again, we will certainly approach the process with fresh eyes and learn from our past experience. 1. Familiarize candidates with their future boss. There is a saying that an employee comes to the company and leaves the boss. If he/she is so important in the process of job selection, it would be worthwhile to consider this. Familiarizing candidates with management within the first stage of recruitment is essential. 2. Useful to use images or a video, not only from Stock. We live in a modern time dominated by images and video (memes, comic books, infographics). Use of this kind of media can be more attractive and better distinguish your job offer from the rest of the posts out there. Due to the use of video, the applicant feels that we made an effort to present a specific job position for them to apply to. or a picture of a future team. There are few people who look for the jobs on Facebook. However, it is also a place with a lot of interaction, where our candidates and their friends spent a great deal of time. Some of them, when seeing a job offer that fits the profile of their friend, willingly tag them in, increasing the chance to reach a candidate for our company. We only have to remember that our advertisement has to fit the nature of the channel. Obviously, our suggestions can be improved. It is not always possible to make a recruitment video. The future boss sometimes does not want to present himself/herself in front of the camera. And not every candidate will like such a form of communication. Job offers on Facebook may also become tiresome. However, we think that experiments may prove worthy. Making a movie. Adding infographics or a picture to the advertisement. Asking a manager to write a short letter for candidates, explaining who he/she really needs, in his own words. 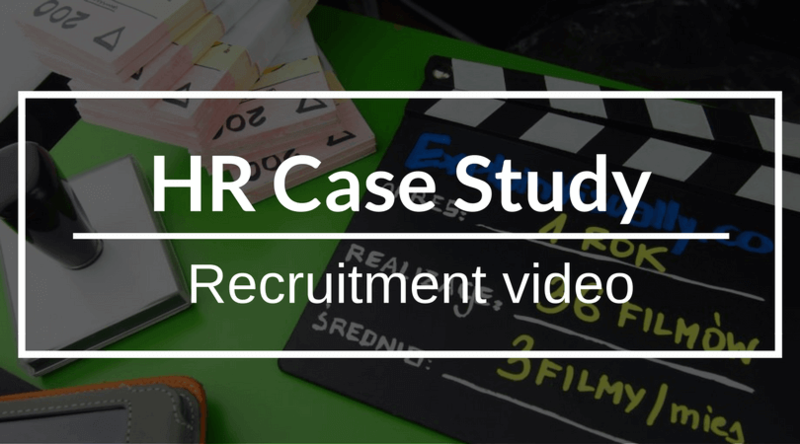 There are many possibilities and we hope that our HR Case Study will encourage you to initiate the search. Maciej Budkowski—a psychologist and marketer in ExplainVisually, responsible for marketing and sales. During his studies at the University of Warsaw, he studied the influence of large amount on information on the level of information processing. Then, he managed communications in IS-Wireless, a high-tech telecom company. He gave a lecture entitled “The use of visual thinking in building customer experience” at the Marketing Summit 2016. You can find some of his psychology-related articles on imprific.com. One of the biggest producers of whiteboard animation videos in Europe, it regularly works with the biggest brands in the world, NGOs, SMEs and start-ups. ExplainVisually services are provided to such organizations as Carlsberg, UniCredit, Orange, Credit Agricole, Millennium Bank, Remondis, AmRest, ING, PARP, Pratt&Whitney, BZWBK (Santander Bank), Tesco and TEDx.